The U.S. Army Command and Staff School (CGSS), Fort Belvoir, Virginia Satellite Campus, recently concluded its elective course on Interagency and National Security Coordination to a true interagency audience. The five-week course began in January 2018 and ended at the end of February 18. 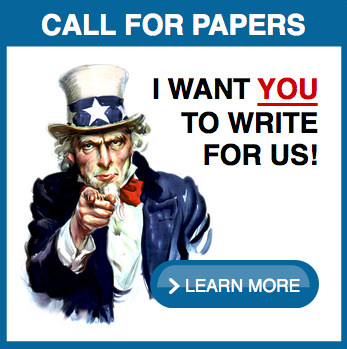 The elective is hosted through the support of the U.S. Agency for International Development (USAID) Office of Civilian Military Cooperation and the State Department’s Political Military University. 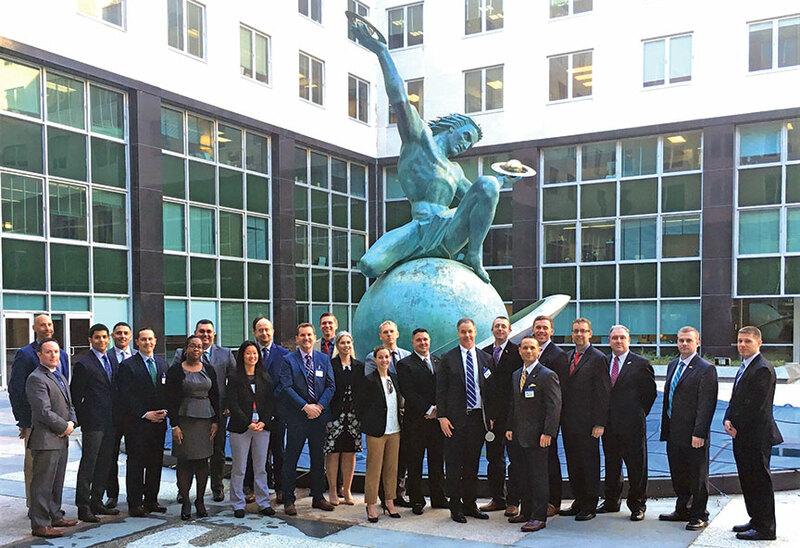 Students in this most recent elective course were comprised of not only U.S. Army Command and General Staff Officer Course (CGSOC) officers, but also six members from the U.S. Customs and Border Protection and USAID. Notable non-CGSOC attendees included USAID’s Management Bureau Deputy Assistant Administrator, Albert Bullock, and the Director for West African Affairs, Edith Houston, along with Jessica McCullough from the U.S. Department of State, Officer Carlos Villarreal from the U.S. Department of Homeland Security, and Jefferson Science Foundation Fellow, John Muth. 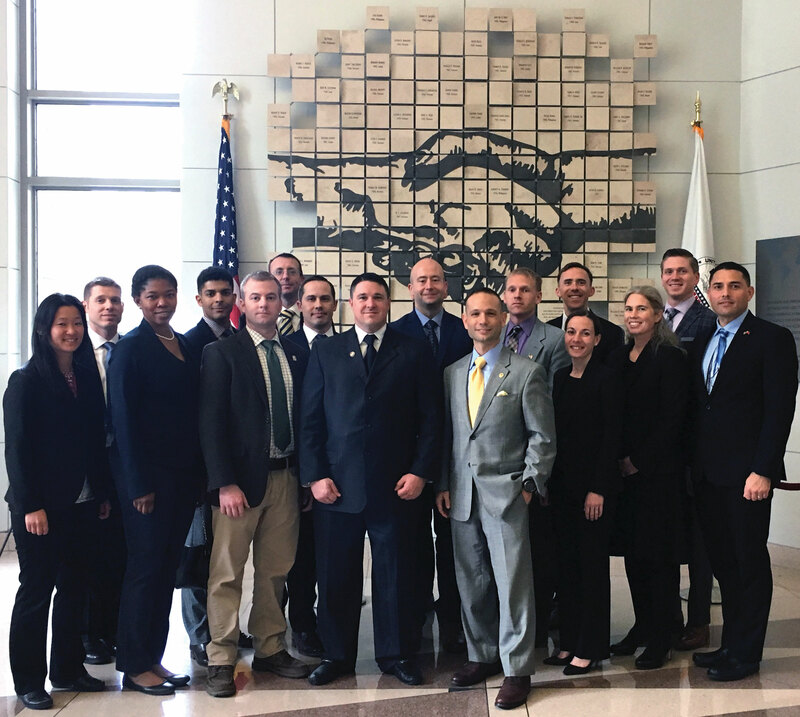 Students from DoD, USAID, Customs and Border Protection, and the State Department take a group photo Feb. 28 in the USAID Headquarters as part of the Interagency and National Security Coordination elective course at the CGSS satellite campus at Fort Belvoir, Virginia. Lt. Col. Aric Raus, an instructor in the CGSS Department of Army Tactics (DTAC) at the Fort Belvoir Satellite Campus, authored the “Interagency and National Security Coordination” elective course. He had witnessed a need for greater understanding on interagency coordination while serving a three-year assignment as the U.S. Africa Command (AFRICOM) Liaison to USAID. During that tour, he developed an understanding of the importance of civilian-military coordination while working to synchronize Department of Defense (DoD), USAID and State Department operations during stabilization and development operations. 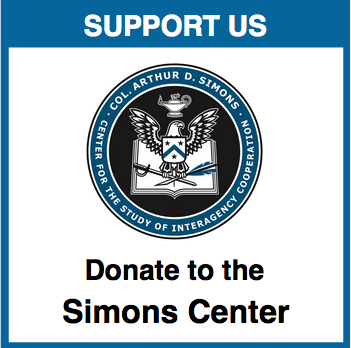 The intent of the elective is to provide students with a greater understanding of the need for interagency coordination, along with the formal and informal avenues through which they are conducted. Another main focus of the course is largely unknown interagency operating environments, including Disaster Assistance Response and areas transitioning from conflict to long-term development. The course is composed of three classroom sessions that introduce participants to different elements of the “interagency.” These classroom sessions are followed by two additional sessions – an Interagency Subject-Matter-Expert (SME) session conducted at USAID Headquarters in Washington, D.C., and a Roundtable discussion with senior interagency leaders from Diplomatic, Development and Defense (3Ds) agencies along with a director from the National Security Council. The SME session exposes students to the little known elements of the interagency that DoD operates within the whole-of-government environments. These environments include U.S. Public Health Service support to the Global Health Initiative, the USAID’s Counter-Violent Extremism activities, along with 3D participation in the Women Peace and Security Act. The SME session in the recent course was conducted Feb. 28 at the USAID headquarters. The highlight of the elective course is the 3D Senior Leader Roundtable discussion. The discussion permits students to engage in a free flowing, Chatham House rules discussion with senior government officials who have served in interagency postings at the tactical, operational and strategic levels. Past discussions focused on topics such as cultural biases and conflicting organizational cultures that result in poor coordination. Others covered success stories about how building and maintaining relationships “early and often” overcame seemingly intractable disagreements. Prior roundtable panelists have included USAID’s Executive Secretary & National Security Advisor, Neilesh Shelat, and USAID’s Middle East Bureau Assistant Administrator (Acting), Maria Long; Ambassador Greta Holtz, former U.S. ambassador to the Sultan of Oman; Patrick Antonelli, the director of Peacekeeping and Stability Operations in the Office of the Secretary of Defense for Policy; and the National Security Council’s Director for Humanitarian Assistance, Rachel Grant. The 3D Senior Leader Roundtable discussion for this most recent course was conducted on Feb. 21 at the State Department headquarters in Washington, D.C. The panelists included Antonelli; Dolores Brown, a senior Foreign Service officer from the State Department; Stephen Gonyea, Civilian-Military Operations Division Chief at USAID, and Mr. Alan O’Donnell, interagency integrator in the Joint Staff’s Operational War Plans Division. These panelists provided the students with lessons learned, best practices, along with personal experiences with interagency coordination at the tactical, operational and strategic levels. During the extensive question and answer period of the roundtable, the group of veteran interagency leaders provided recommendations on how DoD interaction with various interagency partners can be improved, addressed some of the challenges associated with interagency operations, discussed the importance of leadership and understanding the personalities of the people they might work with in the interagency. This event enhanced the student’s understanding of interagency operations and supplemented the CGSS C200 Common Core curriculum (Strategic Context), which is designed to increase the student’s understanding of international security and national security organizations. Two faculty members accompanied the CGSS students at the roundtable: Mr. Fredrick Sanders, from the Department of Logistics and Resource Operations (DLRO), and DTAC instructor and course developer Lt. Col. Aric Raus. 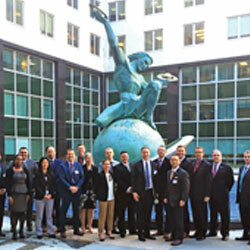 At the conclusion of the roundtable the participants and panelists took a group photo in the State Department courtyard in front of the “The Man and the Expanding Universe Fountain,” where Raus and Sanders presented the panelists with the Fort Belvoir Campus CGSS Coin.